St.Annes Open Air Baths, 1955. 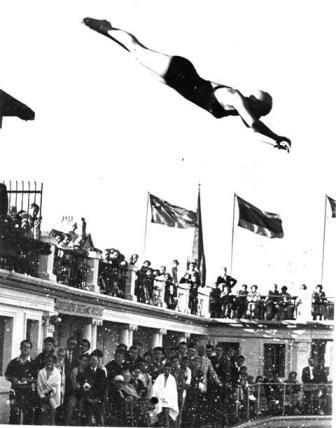 Lytham St.Annes Swimming Club's Gala at St.Annes Open Air Baths, 6th July 1955. The Mayor of Lytham St.Annes (Coun. J Faulkner, JP) presents the Doris & Sydney Feathers Cup for Boys under 14. 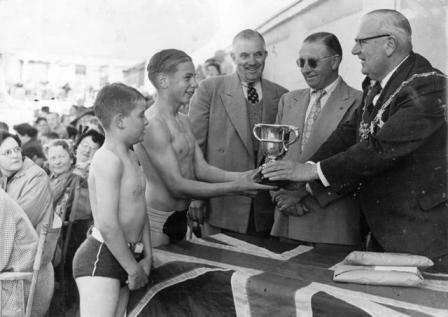 From left: F Mansfield (runner-up), H Banks (winner), Mr E Clegg, Coun. M O'Callaghan (swimming club chairman), the Mayor.